Regular readers of my blog will certainly notice that I've been silent since July 1 when I posted "There are no words for this tragedy" following the murder of three Israeli teens. With Israel in turmoil and its people under constant rocket attacks, it's a challenge to write about anything else. In the past two weeks I've been so consumed reading all of the thoughtful opinion pieces trying to make sense of the current conflict between Israel and the Palestinians that I haven't blogged about anything. My Facebook news feed has been flooded with personal stories of my friends who live throughout Israel running for bomb shelters. And since this conflict is taking place in the summer -- the height of tourist season in Israel -- I'm reading the reflections of my friends from the United States who are visiting Israel this summer and finding their travel itinerary has been altered like they never expected. Rather than hiking in the South and touring Jerusalem's ancient sites, they are experiencing what it's like to have to grab the kids and make it to the shelter in 30 seconds as another errant bomb from Gaza descends overhead. I'm also watching as the global Jewish community walks the tightrope between solidarity and security. Is now the time to travel to Israel to show solidarity with our brothers and sisters there? Is it time to bring Israeli children to Jewish summer camps in America to give them some respite from the daily conflict? At the same time as I'm being invited to travel to Israel for a three-day solidarity mission with the Rabbinical Assembly (the Conservative rabbis' central association), I'm also discussing whether the local Jewish Federation in Detroit should bring the Teen Mission back home for safety (they're cutting the trip short by two weeks and returning to Michigan today). Rather than attempting to make sense out of yet another senseless and violent escalation in the no-end-in-sight Middle East conflict between the Israelis and the Palestinians, I've been intrigued by the way humor is helping Israelis cope with the current situation. The Arab hackers put up status updates like, "Today will strike deep in Israel, Tel Aviv, Haifa, Jerusalem, Ashkelon, Ashdod more than 2000 rockets. We'll start at 7. Counting back towards the end of Israel … Be warned!" 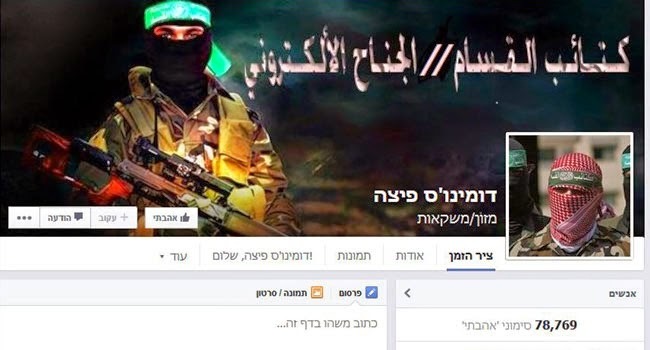 Israelis chose to go with humor in their comments to these violent, threatening Facebook updates. One Israeli commenter posted, "Hey, please reserve a missile for me with jalapenos, green olives, extra cheese, and mushrooms. You have my address. Tell the delivery boy to activate the alarm when it is arriving, so I know to put my pants on." Another photo the Hamas hackers placed on Israel's Facebook page for Domino's Pizza showed Israelis sheltering from rockets in a sewer pipe with the caption "The right place for every Israel - the sewer pipe, hahaha!" An Israeli answered back, "You know who lives in sewers? And what they eat?" with a cartoon of the Teenage Mutant Ninja Turtles and their favorite food - pizza. Once Domino's Pizza recovered the Facebook page back, they posted a photo of Hamas extremists with the words: "You cannot defeat....The Israeli hunger for pizza!" I don't think many Israelis would be able to get through these difficult days without the very witty Facebook posting humor of my friend Benji Lovitt. Benji's a stand up comedian who made aliyah several years ago. His hilarious take on life in Israel has gone into hyper mode in the past couple of weeks. I can't remember the last time I looked at my Facebook feed on my phone and didn't see 3-5 status updates from Benji. Each update is funnier than the last and receives hundreds of likes from Benji's Tel Aviv neighbors and North American fans alike. Benji's comic relief has already been reported by several news outlets. He really has his finger on the pulse of what Anglo Israelis are feeling during these anxiety-ridden days of the conflict. A recent post by Benji reads, "An army statement reveals the success rate of the Israeli defense systems to be at 86%, with some 225 interceptions overall. It was originally announced at 81% until the Iron Dome's mother complained about a lack of extra credit opportunities." Hilarious! Recognizing that humor helps Israelis right now, NY comic Ari Teman is organizing a comedy tour of American comedians who will travel to Israel and perform their comedy in bomb shelters. Ari explains, "I can’t join the IDF tomorrow, but I can bring a few fellow comedians and give folks a laugh. Together with the very funny Danny Cohen from Comedy Central and brilliantly humorous Matthew Maragno from Carolines (his first time in Israel!) 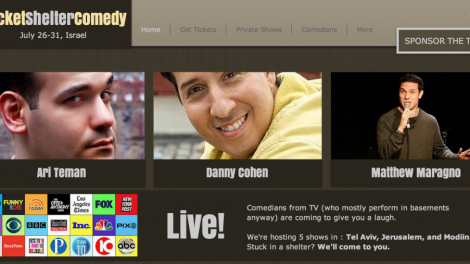 and Tel Aviv’s own Benji Lovitt and Yossi Tarablus, we'll be doing shows in shelters in Tel Aviv, Jerusalem and Modiin. We wish we could do more, but we’re jokers, not soldiers. Comedy is really good at bringing out laughter and smiles in tough times." Free tickets for "Rocket Shelter Comedy" can be acquired online and Ari Teman's group of comedians are willing to travel to bomb shelters with 20 or more adults who speak English but can't travel to one of their shows in Tel Aviv, Jerusalem and Modiin. While the comedy shows are free, Ari asks for a required 20 shekel (about $5 USD) donation to lone soldiers in the IDF. Donations, like the one I've made, are being taken on the website also to help this great idea come to fruition. The Jewish people have endured throughout the centuries with humor. While the situation in Israel is very serious, it's impressive to watch as we continue to laugh to get through it (both in Israel and abroad). Thanks to Benji Lovitt and other very funny people, we can add the comedic genre of bomb shelter humor to gallows humor and foxhole humor. 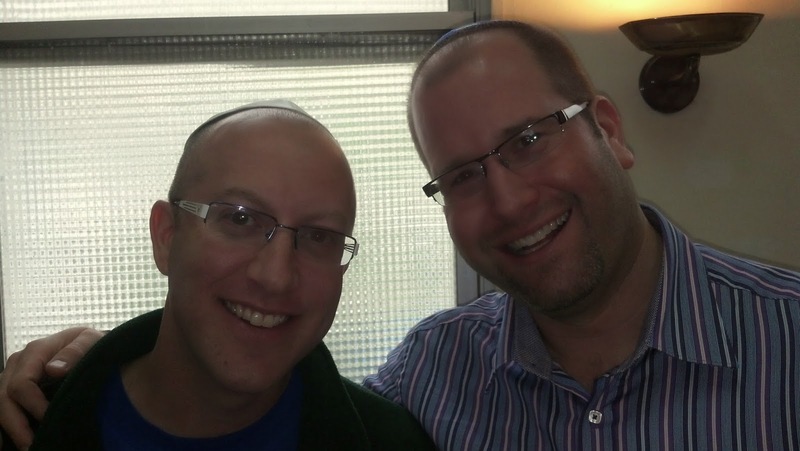 Facebook is serving as the perfect medium to help Israelis maintain their sanity these days. Please join me as I continue to pray for a peaceful end to this conflict (which will also mean my Facebook feed will once again show other friends' posts besides those of Benji Lovitt).